Debt is a destroyer of lives. Not only because it keeps you working to pay someone else but because it can trap you in a paycheck-to-paycheck curse. But there’s an even bigger problem with debt, all the false information and myths. They say ignorance is bliss but not knowing about debt can cost you thousands of dollars. Getting the facts means knowing the most important questions and knowing where to find the answers. I’m starting off with a controversial one but no less important. You’ll hear opposing views on this one all over the internet. 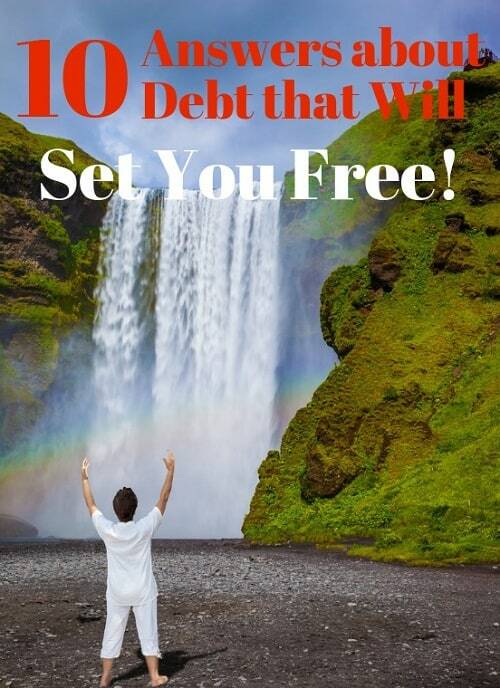 Some very famous advisors and bloggers will tell you to pay off all debt, shun your credit cards and live a debt-free life. I think that’s just dangerous. First of all, debt isn’t the problem. It’s how people use debt to buy crap they don’t need. It’s how debt is used that is a problem. My point, Apple Inc has more than $66 billion in cash and at the same time owes more than $93 billion in long-term debt. If debt is so bad, then why doesn’t the company use all that money to pay down it’s borrowings? Because Apple knows it can borrow at low rates and spend it’s money in better ways like developing new products. It gets a higher return on those new products so it’s not worried about the 3.5% rate it pays on debt. It’s the same way with personal finance. It would have taken me decades to save enough for a home. Could you have afforded that car that helps get you to and from work if not for a car loan? I’m not saying charging that velvet painting of Elvis on your credit cards was a good idea. I’m only saying that using debt responsibly, to buy things you absolutely need and to buy things that earn a return, can be a great decision. How Can I Pay Off Debt on a Low Income? One of my favorite interviews on the YouTube channel is with Chonce Maddox about how she paid off over $30,000 in debt as a single parent and on a low income. The fact that more than 16,000 people have watched the interview tells me paying off debt on less is a common problem. Bloggers love to talk about cutting your budget to pay off debt but that’s just not realistic when you’re barely able to make ends meet as it is. Paying off your debt when you don’t have much to spare means looking at it from both sides of the equation. You can’t just focus on your spending, you have to look at your income and ways to increase it. 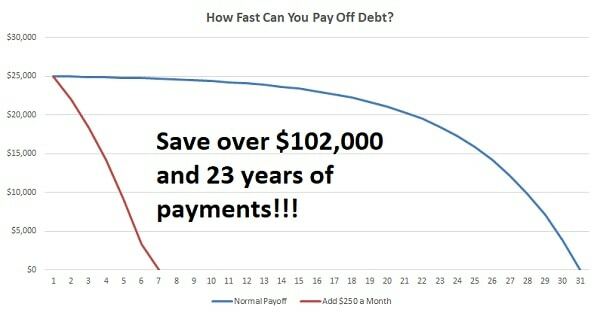 Making just an extra $250 a month will save you over $102,000 paying off a $25,000 loan and save you 23 years’ of payments! With many side hustles, that’s less than 10 or 20 hours a month working on your side project. This is another controversial one. A lot of bloggers will tell you consolidating your debt is crazy. The problem is, all they have is complaints. They never give you REAL solutions. Debt consolidation is taking out a personal loan to pay off your high interest debt like credit cards and other loans. Not only does this save you money on interest from the lower rate but gets you a lower monthly payment you can actually afford. Debt consolidation is a first step to taking control of your debt and getting back on your feet. Personal loans are unsecured so you don’t put your home or car up for collateral. It takes less than five minutes to apply for a loan up to $40,000 and it won’t affect your credit card. In fact, I’ve used personal loans for debt consolidation and a home improvement project. Understand that debt consolidation is a tool and you need to use it right or you’ll smash things up worse than they are. Only use a consolidation loan to pay off higher rate debt, not to just run out and spend more money. Should I Pay Off Debt before I Invest? I hate when I hear this question because so many people ask it and I know it keeps so many from securing their financial future. Look, I’m all for paying off debt but the sad fact is that many people will never be fully out of debt. You know what all people WILL be someday? Retired. If you haven’t saved any money by the time you retire, you’re living on $1,000 a month from social security. I don’t know about you but I don’t know anyone that can live off a grand a month. Of course you should pay off all high-interest debt before you start investing. It makes no sense to be paying 18% on a credit card while you’re investing for 12% returns in the stock market. But if you can get your rates down to 10% to 14% on all your debt, start putting money in your retirement accounts. Money you invest in an IRA or 401K gives you some huge tax benefits that actually mean a higher return. That means even if your stocks only make about 10% a year, you’re actually up much more because of those tax benefits and employer match. How Do I Get Lower Rates on Debt? Lower rates on your debt will save you thousands of dollars but you have to get lenders to play ball. That usually means working to increase your credit score for a few months or even years. There are some quick ways to do that, which I’ll share later in the post, but there are also things you can do to lower your rates now! This is a tough one because sometimes there just isn’t any way out of your debt. Your #1 priority should be either cutting spending or making extra money to pay off your debt, but let’s say you just can’t find a way to make payments. Most importantly is to not ignore it. Your debt problem isn’t going away just because you don’t think about it. In fact, it will only get worse. First is to call all your creditors to make a payoff plan you can afford. Be strong and tell them unless they can lower your payments, you’ll have to file bankruptcy. Next is to negotiate lump sum payments if creditors will take a discount on your debt. You can usually get about 15% or more taken off what you owe if you pay it all at once with a loan. That discount will make payments on your new loan easier. Bankruptcy should be the absolutely last choice. It will destroy your credit for years and increase rates on any loans you get in the future. You can’t talk about debt without also talking about credit and credit scores. All your debt goes on your credit report and your score is what determines rates on debt. It’s a vicious circle for a lot of people but understanding credit will help you crush your debt. Your credit report is a history of all your debt and payments over the last decade. Any loans or credit you get and the payments you make go on your report, compiled by three separate companies. A company called FICO uses the information on your credit report to give you a score from 300 to 850 that is a one-number estimate of your credit. When you apply for a new loan, lenders look at your credit report and your FICO score to approve or deny the application. So what credit score will get you the best rates? What credit score do you need just to get a loan? There’s no such thing as a ‘good’ credit score but there is one number you should aim for with your FICO. Most banks and credit unions cannot lend to people under a certain credit score called sub-prime. Borrowers with a prime credit score, above 680 FICO, qualify for government loan guarantees. That means the bank can sell the loan to investors for the cash to make more loans. So while you will be able to get a loan with a score under 680 FICO, rates are going to be higher and you’ll likely be denied by traditional banks. A credit score around this point is still not too bad but once your FICO gets below 580, you’ll have a problem getting any loan approved. There is only one website to get your free credit report, annualcreditreport. Any other website you use will be through special pricing on credit monitoring or limited-time offers. You are only allowed to get your credit report free one time a year. There are times where you might need to get your report like before applying for a loan or just to make sure your identity is safe from hackers. Fortunately there are websites that offer a free look at your credit and no obligations to use their credit monitoring service. I use the TransUnion service to monitor my credit but there’s nothing wrong with getting your report and then cancelling the plan. How Long Do Missed Payments Stay on My Credit? This is one of the biggest misconceptions about credit and debt. A lot of people think that they can make a payment late and it won’t affect their credit. Any missed payment later than 30-days can stay on your credit report for years even after you start making payments again. Just one missed payment on your report can destroy your credit so having more than one over a few years will increase rates on debt and lock you out of getting the money you need. Generally, a missed payment will stay on your credit report for two years but may be on there for as many as five years. Defaulted loans or ones that go to a collections agency can be on your credit for up to seven years and a bankruptcy can destroy your credit for a decade. Getting the facts on debt will help you conquer it and avoid all the problems that keep so many people under crushing payments. These most common questions about debt and credit may be the most important but aren’t the only ones you should ask. Ask any debt questions you have in the comments below and I’ll make sure you get an answer.